I have changed up my hair colour a little! My instructor at Aveda, Dominique, suggested that I colour my fringe black. I was ready for a little change so I agreed. Then the next week I decided that I wanted black ombré on my ends. I am surprised at how quickly my hair has grown again since I cut 3" off in September and it already feels like it's as long as before I cut it. The colours in my hair are 1N (black) and Special Effects Deep Purple (approx. 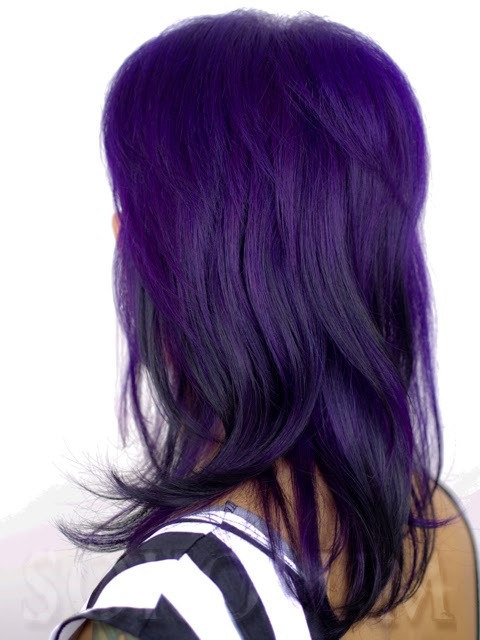 1:2 ratio of Deep Purple and conditioner). Here are photos of my cut.